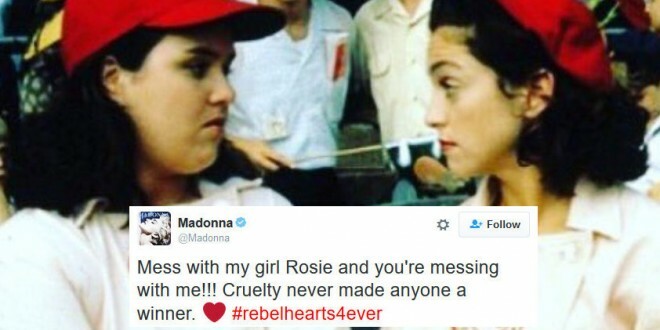 Madonna Hits Trump For Renewed Attack On Rosie O'Donnell: Mess With My Girl And You Mess With Me - Joe.My.God. Madonna might not feel sorry for her friend, but she did feel the need to show her some love. “Mess with my girl Rosie and you’re messing with me,” the singer wrote, sharing a picture from the 1992 film A League of Their Own when Mo and Ro played BFFs “All the way Mae” Mordabito and Doris Murphy, respectively. O’Donnell also posted some tweets about The Donald, calling him an “orange” body part, and sharing a clip from when she says their feud began. In the video from The View, O’Donnell tousled her hair to mimic Trump’s mane, and said the Republican nominee annoyed her “on a multitude of levels” when discussing Tara Conner, Miss USA 2006.